In 2016, we created a film titled Zerzura. The story concerns a young man Ahmoudou Madassane, disillusioned with the pastoral life. He sets off for the city, where he learns of his brother’s mysterious disappearance. His journey leads him on an unexpected quest, crossing the perilous desert towards an enchanted oasis of gold and riches, protected by magical djinn. At its heart, Zerzura is a cautionary folktale about the unchecked desire and dreams projected onto empty spaces. Every film could be said to be an experiment, but this project leaned heavily into chaos. Reality intervened and forced us to relinquish any singular narrative and reflect instead on the collective dream. At the end of our shoot, we had lots of disjointed footage, most entirely off-script and improvised. This wasn’t a problem. Zerzura is in effect a road movie and was produced in this manner: Ahmoudou and I, traveling on a motorcycle through Agadez and the surrounding deserts, camera in hand, filming whenever the landscape inspired us. Dialogue punctures a film that is a largely impressionistic meditation. In 2017, Ahmoudou joined me at my home in Portland to participate in the post-production. During that time, we edited the film, translated the dialogue, and recorded foley. But most importantly, we created an all original score. Taking a cue from the process of ethnofiction proposed by Jean Rouch, this score took the place of narrative voice-over, with Ahmoudou speaking with his instrument, drawing color and emotion into the silent stretches of desert. In June of 2017, we stepped into Portland’s Type Foundry studio. 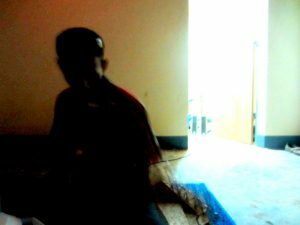 We borrowed a projector, tacked a bedsheet to the wall, and broadcast the rough cut of the film. 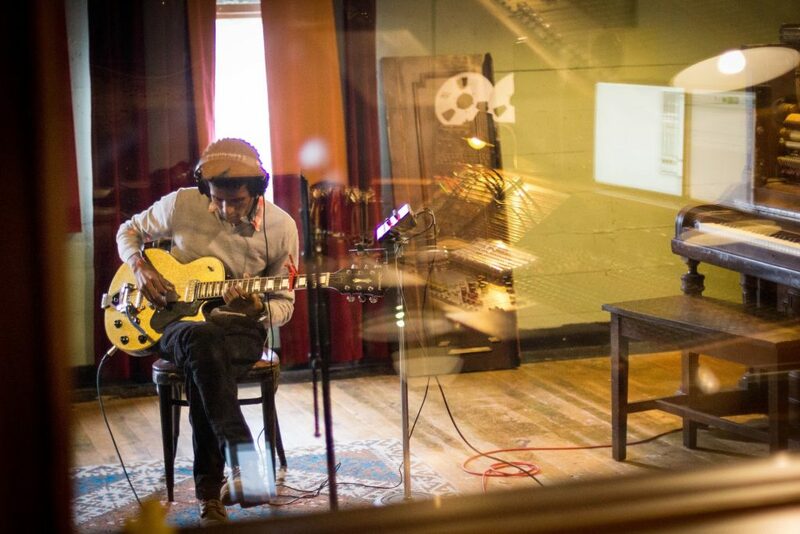 Ahmoudou Madassane, besides being actor and producer, is also a talented guitarist (playing with Mdou Moctar and Les Filles de Illighadad) Over three days, Ahmoudou led the creation of improvisational guitar pieces. Joined in the studio by Portland artist Marisa Anderson and engineer Jason Powers, we used material at hand: a variety of percussion, prepared piano, Moog, and whatever other instruments happened to be lying around. In the end, these pieces took their place in the background, letting the primary instrument shine: the electric guitar. There is nothing that says Tuareg music like the electric guitar. In particular, Nigerien folk music has leaned heavily into the instrument with Agadez musicians the first to embrace pedals and distortions. In some ways, these effects had always present in the genre, albeit it an unintended consequence of maxed and blown amplifiers. 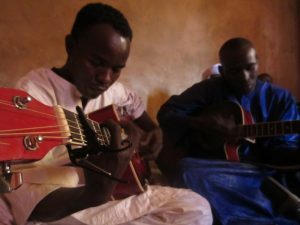 While it began as political folk music, the sound of Tuareg guitar has expanded into a plethora of variations: energizing wedding parties, played while sipping tea in streetside fadas, and recorded onto DVDs / mp3s / WhatsApp. Today’s guitar music is the stuff that launches careers at home, in the diaspora, or on the Western World Music stage. On the other hand, the genre still obeys strict rules. Songs are in the pentatonic scale, rarely invoke more than a few chords, and feature a prominent single drone beneath the melody. There is a predictable and well-defined structure with refrains, call and response lyrics, and solos. While “experimental” music thrives under Western privilege this not the case in Niger. A conservative current runs through cultural production and avant-garde means something different. The opportunities to create left field art are rarely presented. Zerzura offered an opportunity to try something new, taking Tuareg guitar into noise, drone, and ambient. This free-form session forgoes the creation of “songs,” for the creation of the soundscapes. Maybe not surprisingly, these ambient pieces were already present in the genre, hiding in plain sight. Ahmoudou developed and drew on the “practice notes” or segue that come before a song; rambling improvisations, regularly performed prior to a song to alert and cue the band for the upcoming song (This was something we previously experimented on the soundtrack to Mdou Moctar’s Akounak with the film music “intermissions”). The resulting sessions were cut down and mixed, forming the score of the film and this atmospheric recording. 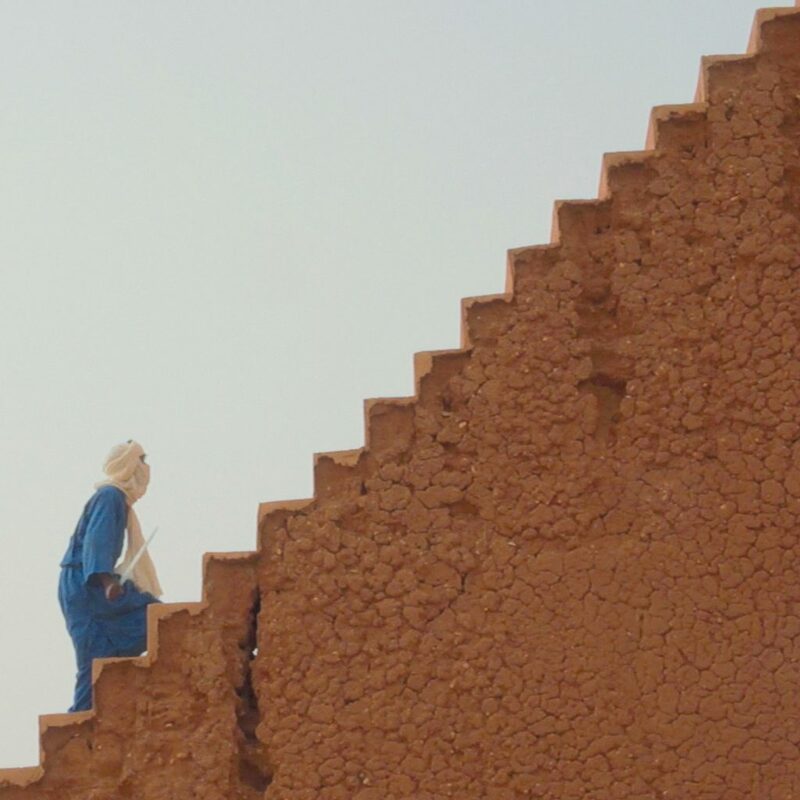 They featured throughout the film, but are also revisited here, as a soundtrack and new direction in Tuareg music. The creation of Zerzura was much closer to documentary than fiction. This nefarious line between real and unreal was attacked until it simply gave up and crumbled, like the wall of an ancient desert settlement swept under by sand. We staged scenes with deadly bandits and subsequently met real bandits. We filmed in the gold fields and were accused of stealing gold. We invoked djinnis, and we were followed by a strange wind, shimmering over the dunes, rustling dried palms, and spiraling upwards into ephemeral dust giants stalking us through the wastelands. Ahmoudou’s score was raw creation as much as invocation, conjured from thousands of years of desert myth, to tell an old story in a new means. The Zerzura score is a narration that needs no words, an appeal to music that can transcend what is said for what is simply felt. Zerzura Original Film Soundtrack is available now on LP/CD/Digi from Bandcamp & the shop.